"Union College of Law" redirects here. It is not to be confused with Union Law School. Northwestern University Pritzker School of Law, often shortened to Northwestern Pritzker School of Law, is one of the professional graduate schools of Northwestern University, located in Chicago, Illinois. Northwestern Law is a member of the "Top 14 (T-14)", a group of law schools that have national recognition. Founded in 1859, it was the first law school established in Chicago. Notable alumni include: Arthur Goldberg, United States Supreme Court Justice; Governor of Illinois, cabinet secretary, and Democratic presidential candidate, Adlai Stevenson; John Paul Stevens, United States Supreme Court Justice; Newton Minow, former Chairman of the Federal Communications Commission; and Harold Washington, and the first black Mayor of Chicago (1983–87) and earlier a member of the U.S. House of Representatives. 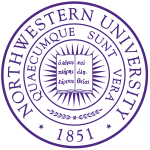 Founded in 1859, the school that would become known as the Northwestern University Pritzker School of Law was the first law school established in the city of Chicago. The school was originally the law department of the Old University of Chicago under the founding direction of Henry Booth and enrolled twenty-three students. The law school became Union College of Law when it jointly affiliated with Northwestern University in 1873. In 1891, the law school formally became Northwestern University School of Law when Northwestern assumed total control. Throughout the 20th century, programs such as the JD-MBA and JD-PhD were added to maintain the law school's position as one of America's top-ranked schools of law. In October 2015, it was named, Northwestern Pritzker School of Law, after J.B. Pritzker and his wife, M.K. Pritzker, gave $100 million to the law school. Northwestern Law is located on Northwestern University's downtown campus in Chicago's Streeterville/Gold Coast neighborhood. 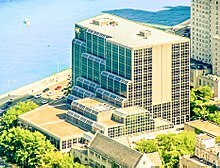 The law school is on Lake Shore Drive and Chicago Avenue, adjacent to Lake Shore Park and Lake Michigan, and a few blocks from the John Hancock Center, Magnificent Mile, Water Tower, Oak Street Beach, and Navy Pier. The law school's location in the heart of downtown Chicago provides a wealth of part-time employment options for students while in school and a setting in which to study law. The proximity to courts, commerce, and public interest activities enables students to experience the practice of law, as well as its theory. Admission to Northwestern Law is extremely competitive. For the class entering in the fall of 2016, 821 out of 4,070 applicants (20%) were offered admission, with 213 matriculating. The 25th and 75th LSAT percentiles for the 2016 entering class were 163 and 170, respectively, with a median of 168. The 25th and 75th undergraduate GPA percentiles were 3.43 and 3.89, respectively, with a median of 3.81. The law school's practical philosophy is manifested in a strong preference for applicants with at least two years of work experience. Approximately 90% of the school's students enter with at least one year of full-time work experience; 70% possess more than two years of experience. In this respect, Northwestern Law is similar to many business schools. According to U.S. News & World Report's 2017 Edition, 79% of the law school's 2016 graduates obtained prospective, full-time employment prior to graduation, with a median starting salary of $180,000. According to Northwestern's official 2016 ABA-required disclosures, 91% of the Class of 2015 obtained full-time, long-term employment nine months after graduation. Northwestern's Law School Transparency under-employment score is 8.8%, indicating the percentage of the Class of 2013 unemployed, pursuing an additional degree, or working in a non-professional, short-term, or part-time job nine months after graduation. Northwestern Law is well-established among BigLaw firms (defined as firms with 150 or more associates). In Vault's 2016 survey, of over 15,000 BigLaw associates, Northwestern Law ranked #2 as a "feeder" school for BigLaw firms, after accounting for school size. According to Vault, Northwestern Law outperforms its expected BigLaw representation by 315%. The law school enrolls approximately 985 students in its J.D., LL.M., S.J.D. and M.S.L. (Master of Science in Law) programs. The school employs an interdisciplinary research faculty, and has a low student-faculty ratio. According to Northwestern's 2016 ABA-required disclosures, 93% of the Class of 2016 obtained full-time, long-term employment nine months after graduation. The total cost of attendance (indicating the cost of tuition, fees, living expenses, books, and other miscellaneous expenses) at Northwestern Law for the 2015-2016 academic year is $79,904. The Law School Transparency estimated debt-financed cost of attendance for three years is $292,586. Northwestern Law sponsors six student-run scholarly legal journals. Student staff members are selected based on a writing competition, editing competition, and first-year grades, or a publishable note or comment on a legal topic. The Journal of International Law and Business has a substantive focus on private international law, as opposed to public international law or human rights. It seeks scholarship analyzing transnational and international legal problems and their effect on private entities. The Journal's stated goal is to promote an understanding of the future course of international legal developments as they relate to private entities. The Northwestern University Law Review was first published in 1906 when it was called the "Illinois Law Review." Prior editors include: Roscoe Pound, long-time dean of Harvard Law School; Judge Robert A. Sprecher of the United States Court of Appeals for the Seventh Circuit; US Supreme Court Justice John Paul Stevens; Dean James A. Rahl; Illinois Governor Daniel Walker; and former chairman of the Federal Communications Commission Newton N. Minow; US Supreme Court Justice Arthur Goldberg and Presidential Candidate Adlai Stevenson. The Northwestern Journal of Technology and Intellectual Property addresses subjects relating to law at the intersection of technology and intellectual property, including law and biotechnology, copyrights, the Internet, media, patents, telecommunications, and trademarks. The School states that its Journal of Criminal Law and Criminology "is one of the most widely read and widely cited publications in the world". It is the second most widely subscribed journal published by any law school in the country. It is one of the most widely circulated law journals in the country. The journal was founded in 1910 by Dean John Henry Wigmore. The Journal of Law and Social Policy is an interdisciplinary journal that explores the impact of the law on different aspects of society. Topics covered include race, gender, sexual orientation, housing, immigration, health care, juvenile justice, voting rights, family law, civil rights, poverty, the environment, and privacy rights. The Journal of Human Rights is an interdisciplinary journal dedicated to providing a dynamic forum for the discussion of human rights issues and law. The Journal seeks contributions from professionals, scholars, and experienced field workers of every background, including but not limited to law, business, political science, public policy, economics, sociology, religion, and international relations. In addition to publication, the Journal seeks to promote the discussion of human rights law by organizing semi-annual Symposia and a Speaker Series. The Journal of Human Rights was founded in 2003 as the Journal of International Human Rights, but adopted its present name in 2016 to better reflect its focus. 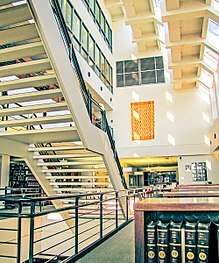 The Pritzker Legal Research Center is home to more than 829,974 books, journals, and other publications. The Pritzker Legal Research Center is the library, and fulfills the research and information needs of the faculty and students of Northwestern Law. The Center is named after the Pritzker family, a philanthropic Chicago family. Jay A. Pritzker (1922-1999) graduated from Northwestern University in 1941 and Northwestern University School of Law in 1947. Clinical education at Northwestern dates back to the law school's beginnings. An innovative program developed by Dean John Henry Wigmore in 1910 with the Chicago Legal Aid Society evolved into the Legal Clinic, which opened its doors in 1969 with only two staff attorneys. In 2000, the Clinic was named for Northwestern University trustee and alum Neil Bluhm. Today, the Bluhm Legal Clinic houses more than 20 clinics within 14 centers and is widely recognized as one of the most comprehensive and effective clinical programs in the country. Through the law school's clinical program, students gain direct experience representing clients and fine-tune their skills as advocates. They also work with clinical faculty and staff to challenge the fairness of our legal institutions and to propose solutions for reform. For the Journalism School project, see Medill Innocence Project. The Center on Wrongful Convictions (CWC) is dedicated to identifying and rectifying wrongful convictions. The Center investigates possible wrongful convictions and represents imprisoned clients with claims of actual innocence. It also focuses on raising public awareness of the prevalence, causes, and social costs of wrongful convictions and promoting reform of the criminal justice system. Faculty member Prof Steven Drizin founded the sister project to this Center which is specifically aimed at juvenile convicts; Center on Wrongful Convictions of Youth. The Appellate Advocacy Center includes the Federal Appellate Clinic and the Supreme Court Clinic. The Federal Appellate Clinic allows third-year students to obtain provisional law licenses and argue cases before the United States Court of Appeals for the Seventh Circuit. Students in this clinic spend an entire year representing a criminal appellant, from merits briefing to oral argument. The Supreme Court Clinic enables students to act as Supreme Court litigators in partnership with attorneys at Sidley Austin, including Northwestern Law alum Carter Phillips, who has argued more cases in front of the Supreme Court than any other lawyer while in private practice. The Children and Family Justice Center represents young people on matters of delinquency and crime, family violence, school discipline, health and disability, and immigration and asylum. Attorneys, a social worker, and affiliated professionals help second- and third-year law students meet with clients, research legal issues, learn pretrial investigation, interviewing, and counseling skills, and litigate cases. The MacArthur Justice Center focuses its work on police misconduct, wrongful detention compensation, post-9/11 work, and other public interest and civil rights issues. Of particular note is the Guantanamo Bay detainee representation led by Joseph Margulies, author of Guantanamo and the Abuse of Presidential Power and lead counsel in Rasul v. Bush. The Donald Pritzker Entrepreneurship Law Center (DPELC), founded as the Small Business Opportunity Center (SBOC), is a transactional clinic that was founded in 1998. Clients include technology executives, consultants, inventors, manufacturers and sellers of consumer products, musical groups, and persons interested in establishing nonprofit organizations. The Center is also heavily involved in teaching in the field of entrepreneurship law, and hosts symposia and conferences to facilitate that endeavor. The Center for International Human Rights works to advance human rights while enabling students to test and refine their academic learning in real cases. Stressing a comprehensive interdisciplinary approach, the center provides policy perspectives to the United Nations, the Organization of American States, the U.S. Department of State, foreign governments, and nongovernmental organizations. Over the years faculty and staff working in the center have addressed, among other matters, the role of the International Criminal Court, international terrorism, U.S. death penalty laws, truth commissions, economic rights, NATO's humanitarian intervention, and political asylum cases. Students have investigated cases and had summer internships in Guatemala, Indonesia, and at the U.N. Human Rights Centre in Geneva. The Center also offers students an opportunity to earn an LLM in Human Rights. The degree program is designed for students from transitional democracies and for those with career interests in international human rights law. The Investor Protection Center provides assistance to investors with limited income or small dollar claims who are unable to obtain legal representation. Law students, under the supervision of faculty attorneys, represent customers in handling their disputes with broker-dealers. During the last few years, the (Financial Industry Regulatory Authority)(FINRA) and other organizations have taken steps to make more information and services available to investors. Northwestern Law's Investor Protection Center operates with the aid of grants from the FINRA Investor Education Foundation and other organizations to focus on priority areas. In particular, the Center is focused on helping to meet the needs of women, novice investors, and the elderly, in connection with securities arbitration. Named in honor of an innovative leader in litigation and business strategies, the Fred Bartlit Center for Trial Advocacy was established in 1999 to conduct research and teach innovative and technologically advanced trial strategy. The Bartlit Center focuses on changes in trial craft brought on by new technologies and compensation approaches. The Bartlit Center sponsors and conducts academic research on the litigation process; support teaching skills in the JD program; and holds national conferences to explore and teach innovative trial and trial management strategies. The Bartlit Center works to complement the law school's program in simulation-based teaching of trial skills and builds on the research produced by Northwestern Law faculty. The 2016 student/faculty ratio was 6.5 to 1. Charles T. McCormick, expert on evidence, damages, and federal court procedure; writings include the classic hornbooks, Handbook on the Law of Damages (1935) and Handbook on the Law of Evidence (1954). John O. McGinnis, renowned expert on trade law and one of nation's leading scholars in the field of Constitutional Law. Dawn Clark Netsch, expert in governmental organization law and the first woman to be nominated by a major political party to run for Governor of Illinois. Roscoe Pound, former dean of Harvard Law School, founder of the movement for "sociological jurisprudence"
The Chicago Code was substantially filmed on the Northwestern Law campus in Chicago. This television drama premiered on Fox on February 7, 2011. Filming at Northwestern Law began in August 2010. Classrooms in the law school are depicted as interior offices for the fictional offices for City administration. Levy Mayer 212 served as the main taping location at the law school. In The Judge, Robert Downey Jr. plays the role of a Chicago defense attorney who is a Northwestern Law graduate. Prof Steven Drizin and Prof Laura Nirider feature heavily in the 2016 Netflix documentary Making a Murderer as the post-conviction legal representatives of Brendan Dassey. Dassey’s confession is thought by many to be false and coerced, so both Drizin and Nirider are acting as part of work by the Center on Wrongful Convictions of Youth. ^ a b c d e f g "U.S. News & World Report 2017 Edition". Grad-schools.usnews.rankingsandreviews.com. Retrieved 11 October 2017. ^ "Northwestern Pritzker School of Law Logo and Identity". Law.northwestern.edu. Retrieved 11 October 2017. ^ "Best Law Schools". Grad-schools.usnews.rankingsandreviews.com. Retrieved 11 October 2017. ^ a b "Arthur J. Goldberg". Oyez.org. Retrieved 11 October 2017. ^ a b "John Paul Stevens". Oyez.org. Retrieved 11 October 2017. ^ a b "Newton Minow". Sidley.com. Retrieved 11 October 2017. ^ a b c "Harold Washington". Biography.com. Retrieved 11 October 2017. ^ Tokarz, Karen (January 1990). "A Tribute to the Nation's First Women Law Students". Washington University Law Review. 68: 101. ^ Bowean, Lolly. "Northwestern's law school gets $100 million Pritzker gift, new name". Chicago Tribune. Retrieved 2018-08-26. ^ "2016 Standard 509 Report" (PDF). Law.northwestern.edu. Retrieved 11 October 2017. ^ a b c "US News: Login page". Premium.usnews.com. Retrieved 11 October 2017. ^ "Admissions: Northwestern Pritzker School of Law". Law.northwestern.edu. Retrieved 11 October 2017. ^ a b "Employment Statistics" (PDF). Law.northwestern.edu. Retrieved 11 October 2017. ^ "Northwestern University Profile". Lstscorereports.com. Retrieved 11 October 2017. ^ "The Best Law Schools for BigLaw Jobs". Vault. Retrieved 11 October 2017. ^ "Journals, Research & Faculty: Northwestern Pritzker School of Law". Law.northwestern.edu. Retrieved 11 October 2017. ^ "Northwestern Journal of International Law and Business - Northwestern University School of Law". Law.northwestern.edu. Retrieved 11 October 2017. ^ a b c "Northwestern Law - TLS wiki". Top-law-schools.com. Retrieved 11 October 2017. ^ "Journal of Criminal Law and Criminology - Northwestern University School of Law". Law.northwestern.edu. Retrieved 11 October 2017. ^ "Northwestern Journal of Law & Social Policy - Northwestern University School of Law". Law.northwestern.edu. Retrieved 11 October 2017. ^ "Northwestern Journal of Human Rights - Northwestern University School of Law". Law.northwestern.edu. Retrieved 11 October 2017. ^ "U.S. News & World Report LP". Grad-schools.usnews.rankingsandreviews.com. Retrieved 11 October 2017. ^ "Center on Wrongful Convictions: Bluhm Legal Clinic, Northwestern Pritzker School of Law". Law.northwestern.edu. Retrieved 11 October 2017. ^ "Appellate Advocacy Center: Bluhm Legal Clinic, Northwestern Pritzker School of Law". Law.northwestern.edu. Retrieved 11 October 2017. ^ "About Us, Children and Family Justice Center: Bluhm Legal Clinic, Northwestern Pritzker School of Law". Law.northwestern.edu. Retrieved 11 October 2017. ^ "Donald Pritzker Entrepreneurship Law Center: Bluhm Legal Clinic, Northwestern Pritzker School of Law". Law.northwestern.edu. Retrieved 11 October 2017. ^ "Bartlit Center for Trial Advocacy: Bluhm Legal Clinic, Northwestern Pritzker School of Law". Law.northwestern.edu. Retrieved 11 October 2017. ^ "U.S. News & World Report 2016 Top Law School Rankings" (PDF). Pdfserver.amlaw.com. Retrieved 11 October 2017. ^ "Brian Leiter's Law School Reports". Leiterlawschool.typepad.com. Retrieved 11 October 2017. ^ "THE GO-TO SCHOOLS". Law.com. Retrieved 11 October 2017. ^ Seidman, Robert (November 3, 2010). "'The Chicago Code' (FKA 'Ride Along') Premieres Night After Super Bowl XLV, Monday, February 7". TV by the Numbers. Retrieved November 3, 2010. ^ "Scholars and Jurists Honor Raoul Berger, About: Northwestern Pritzker School of Law". Law.northwestern.edu. Retrieved 11 October 2017. ^ Bob Goldsborough (March 28, 2013). "George Miller Burditt Jr., former Illinois state representative, 1922–2013". Chicago Tribune. Retrieved May 6, 2013. ^ School, Stanford Law. "G. Marcus Cole - Stanford Law School". Law.stanford.edu. Retrieved 11 October 2017. ^ "Thomas F. Geraghty, Research & Faculty: Northwestern Pritzker School of Law". Law.northwestern.edu. Retrieved 11 October 2017. ^ University, Suffolk. "Charles P. Kindregan - Suffolk University". Suffolk.edu. Retrieved 11 October 2017. ^ a b c d e f g "History, About: Northwestern Pritzker School of Law". Law.northwestern.edu. Retrieved 11 October 2017. ^ "Jonathan Turley - GW Law - The George Washington University". Law.gwu.edu. Retrieved 11 October 2017. ^ "Chicago White Sox: Front Office". Mlb.mlb.com. Retrieved 11 October 2017. ^ CareerBuilder.com. "CareerBuilder.com Names Matt Ferguson President". Prnewswire.com. Retrieved 11 October 2017. ^ "Elbert Henry Gary facts, information, pictures - Encyclopedia.com articles about Elbert Henry Gary". Encyclopedia.com. Retrieved 11 October 2017. ^ "Stocks". Bloomberg.com. Retrieved 11 October 2017. ^ "Robert R. McCormick's Biography - First Division Museum". Firstdivisionmuseum.org. Retrieved 11 October 2017. ^ "History of Kirkland & Ellis LLP – FundingUniverse". Fundinguniverse.com. Retrieved 11 October 2017. ^ "Morgan E. O'Brien - Executive Bio, Compensation History, and Contacts - Equilar Atlas". People.equilar.com. Retrieved 11 October 2017. ^ "J.B. Pritzker - Pritzker Group". Pritzkergroup.com. Retrieved 11 October 2017. ^ "History of Hyatt Corporation – FundingUniverse". Fundinguniverse.com. Retrieved 11 October 2017. ^ "Today in Masonic History - Frank C. Rathje was Born". Masonrytoday.com. Retrieved 11 October 2017. ^ "Chicago White Sox: Front Office". Chicago.whitesox.mlb.com. Retrieved 11 October 2017. ^ Christensen, Kim (21 April 2012). "What kind of man is Dodgers' next owner?". Los Angeles Times. Retrieved 11 October 2017. ^ "Andrew M. Stroth, J.D." Handlerthayer.com. Retrieved 11 October 2017. ^ "George Ball : Alumni Exhibit: Northwestern University Archives". Exhibits.library.northwestern.edu. Retrieved 11 October 2017. ^ "Legends in the Law: Richard Ben-Veniste". Dcbar.org. Retrieved 11 October 2017. ^ "BIGGERT, Judy Borg - Biographical Information". Bioguide.congress.gov. Retrieved 11 October 2017. ^ "William Jennings Bryan : Alumni Exhibit: Northwestern University Archives". Exhibits.library.northwestern.edu. Retrieved 11 October 2017. ^ root. "Dale Bumpers". Nga.org. Retrieved 11 October 2017. ^ a b "Salem Chalabi: Judging Saddam". Middle East Quarterly. 1 September 2004. Retrieved 11 October 2017. ^ root. "Dennis Daugaard". Nga.org. Retrieved 11 October 2017. ^ "Cozen O'Connor: Devine, Richard A." Cozen.com. Retrieved 11 October 2017. ^ "Mayor Edward F. Dunne Biography". Chipublib.org. Retrieved 11 October 2017. ^ Savage, Charlie (21 April 2014). "Obama Names White House Counsel". Nytimes.com. Retrieved 11 October 2017. ^ "The Wisconsin Blue Book". Industrial Commission. 11 October 1887. Retrieved 11 October 2017 – via Google Books. ^ root. "Frank Orren Lowden". Nga.org. Retrieved 11 October 2017. ^ "Converted by Text2Web". Freepages.genealogy.rootsweb.ancestry.com. Retrieved 11 October 2017. ^ "Washington Governor Albert E. Mead". National Governors Association. Retrieved October 10, 2012. ^ a b Caruba, Lauren. "Northwestern Law Prof. Dawn Clark Netsch remembered for 'absolute, unshakeable integrity'". Dailynorthwestern.com. Retrieved 11 October 2017. ^ "Pat Quinn". Governorquinn.com. Retrieved 11 October 2017. ^ "RAILSBACK, Thomas Fisher, (1932 - )". Biographical Directory of the United States Congress. Retrieved October 19, 2012. ^ "RAINEY, Henry Thomas - Biographical Information". Bioguide.congress.gov. Retrieved 11 October 2017. ^ "Jose Abad Santos bio". Bcf.usc.edu. Retrieved 11 October 2017. ^ "A Biography on the life of Jerry Springer". Nytix.com. Retrieved 11 October 2017. ^ A Political Guide for the Workers: Socialist Party Campaign, Book 1920, The Socialist Party of the United States, 1920, p. 15. ^ Compendium of History and Biography of Central and Northern Minnesota, G.A. Ogle & Company, 1904, p. 143. ^ "Adlai E. Stevenson : Alumni Exhibit: Northwestern University Archives". Exhibits.library.northwestern.edu. Retrieved 11 October 2017. ^ "THOMSON, Charles Marsh - Biographical Information". Bioguide.congress.gov. Retrieved 11 October 2017. ^ "James Thompson". Navigant.com. Retrieved 11 October 2017. ^ root. "Daniel Walker". Nga.org. Retrieved 11 October 2017. ^ "Richard E. Wiley". Fed-soc.org. Retrieved 11 October 2017. ^ "Associate Justice Simeon R. Acoba Jr". Courts.state.hi.us. Retrieved 11 October 2017. ^ "The Honorable Dalveer Bhandari". Icj-cij.org. Retrieved 11 October 2017. ^ "Biographical Directory of Article III Federal Judges, 1789-present - Federal Judicial Center". Fjc.gov. Retrieved 11 October 2017. ^ "Chang, Edmond E-Min - Federal Judicial Center". Fjc.gov. Retrieved 11 October 2017. ^ "Flaum, Joel Martin - Federal Judicial Center". Fjc.gov. Retrieved 11 October 2017. ^ "Chief Justice Jim Jones". Isc.idaho.gov. Archived from the original on 21 August 2015. Retrieved 11 October 2017. ^ a b "Judge Kenesaw Mountain Landis (1920-1944)". Sportsecyclopedia.com. Retrieved 11 October 2017. ^ Paul Egan, "U.S. Senate confirms appointment of Joan Larsen to federal appeals court", Detroit Free Press, Detroit, 1 November 2017. Retrieved December 11, 2017. ^ Charlton Thomas Lewis, Joseph H. Willsey. "Harper's book of facts: a classified history of the world; embracing science, literature, and art". Harper & Brothers, 1895, p. 939. This page was last edited on 22 January 2019, at 16:15 (UTC).